The TeamSnap iPhone, iPod Touch, and iPad app integrates communication, paperwork, and scheduling for the efficient management of youth athletic teams. The simple interface, intuitive gestures, and smart graphics provide the perfect backdrop for the most important aspects of team management–group texts and emails, one-touch schedule and calendar sync, photo sharing, document upload, finance tracking, and parent contact information. The free iTunes App Store download allows you to sync information across your devices and your PC or Mac. You can establish a log-in with Facebook or a username and password. By using the username and password account authorization, you can add family members to your account easily. This is also a handy way to add your babysitter who may help with carpool. Then, the babysitter will be able to have the schedule on her or his phone as well. The home screen is a simple list view with team name and your name. A bright pop of orange frames the screen. The list includes the following options–overview, roster, schedule and availability, photos, files, messages, payments, tracking. You simply tap an option to move to a new screen. When you touch the roster icon, a list of coaches, parents, and/or team members appears. You tap your name and touch the edit icon in the top right corner to add pertinent details like email, address, jersey number, and cell phone. For a cell phone, you add your number, authorize the TeamSnap iPhone app to deliver you a text, and add your carrier. By adding the cell service provider, it smooths out the delivery of group texts. There is also an option to add additional contacts on this screen, so you can add babysitters, step-parents, grandparents, or any other people who you want to receive team information. When you check out a team member, parent, or coach’s contact screen, you can add the contact information of parents and team members to your iPhone contacts with one touch at the bottom of a contact’s screen. With a touch on the schedule icon, you can add the team’s schedule or you can access information provided by your TeamSnap administrator. The schedule is available in a list form and may be sorted with one-touch between upcoming and all events. Each game on the list has the date and location, and you tap it to open the details. You can customize with pertinent details like the field number, opponent, date, time of game, arrival time, home/away, result, and notes. In the notes section, you can add links to maps and other relevant information. The coolest option is the ability to add the schedule to your iPhone calendar in one-touch. With this authorization, any adjustments made to the calendar in the TeamSnap iPhone app will automatically change in your iPhone’s calendar. The message tool accommodates group emails and texts with ease. You can post messages to the team within the TeamSnap iPhone app, send an email, and send texts. You touch send an email and a recipients’ list appears. You may touch each person to add individually, or you can select from one of the defaults–select all, all players, and all managers. You write your email, and press send. To send texts, the same options are available. These are useful and vital features for youth athletic team management. 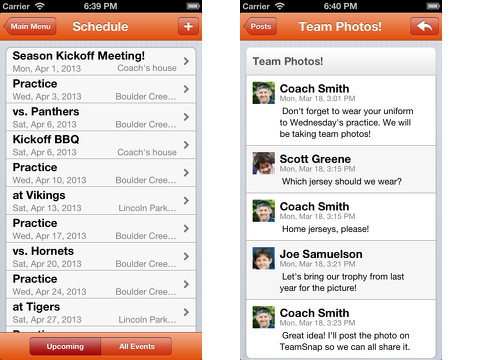 The TeamSnap iPhone app also streamlines important paperwork, financials, and photos. You can upload files like forms that need to be completed, so they can be accessed and completed swiftly. You can track team financials as well. You can also upload and share photos with the team with ease. The tracking feature of the TeamSnap iPhone app also helps those responsible for chasing down completed paperwork and finances stay organized. The TeamSnap iPhone, iPod Touch, and iPad app organizes, manages, and coordinates, so you, your child, and families on your team can spend more time focusing on the game. AppSafari review of TeamSnap was written by Jenni Ward on August 21st, 2013 and categorized under App Store, Calendar, Contacts, Free, Kids, Productivity, Sports, Utilities. Page viewed 5072 times, 1 so far today. Need help on using these apps? Please read the Help Page.